Who can resist a warm, pillowy, sugar-coasted jam doughnut? Our foolproof recipe will have you churning them out by the bucket load. Sprinkle the yeast and 5g of the sugar into a small jug containing the warm water. Stir to dissolve and froth up slightly. Sift the flour, the rest of the sugar and salt into a large bowl. Using your fingertips, rub the butter into the flour mix until it has the texture of breadcrumbs. Stir in the eggs, then pour in the yeast mix. Bring together into a soft dough (add a little water if it’s dry), turn out onto a lightly floured work surface, then knead for 10 minutes or until springy. If you have a mixer with a dough hook, work the dough for 5 minutes on medium. Check by pressing in a finger or thumb – the dough should spring back. Put the dough in a lightly oiled bowl, cover with cling film and leave to rise in a warm place for 1 hour or until doubled in size. Once the dough has risen, knock out the air by kneading it for 3-4 minutes on a lightly floured surface (to help it prove evenly). Rest for 5 minutes (see Make Ahead). Divide the dough into 20 equal pieces, then shape into balls between the palms of your hands and put on 2-3 lightly oiled baking sheets, leaving room for the balls to expand as they prove. Lightly grease a sheet of cling film, then cover the dough balls loosely. Leave in a warm place until doubled in size (1-2 hours). When the dough balls have proved, partly fill a deep, heavy-based pan with sunflower oil and, using a digital probe thermometer, heat the oil over a medium heat to 160°C. Once the oil has reached the correct temperature, use a lightly floured palette knife to pick up a doughnut, then slowly ease it into the hot oil. Fry in batches for 3-4 minutes on one side, then flip and cook for 3-4 minutes until both sides are golden brown. They float, so you may need to poke them down once or twice to help them colour evenly. Remove with a slotted spoon to a plate lined with kitchen paper. Repeat with the remaining dough. Continue to check the oil temperature – too hot and the doughnuts will colour quickly but be raw in the centre; too low and they’ll absorb the oil and become greasy. Once the doughnuts have cooled slightly, use a skewer to poke a hole in one side of each one, just big enough to fit the end of the piping bag in. 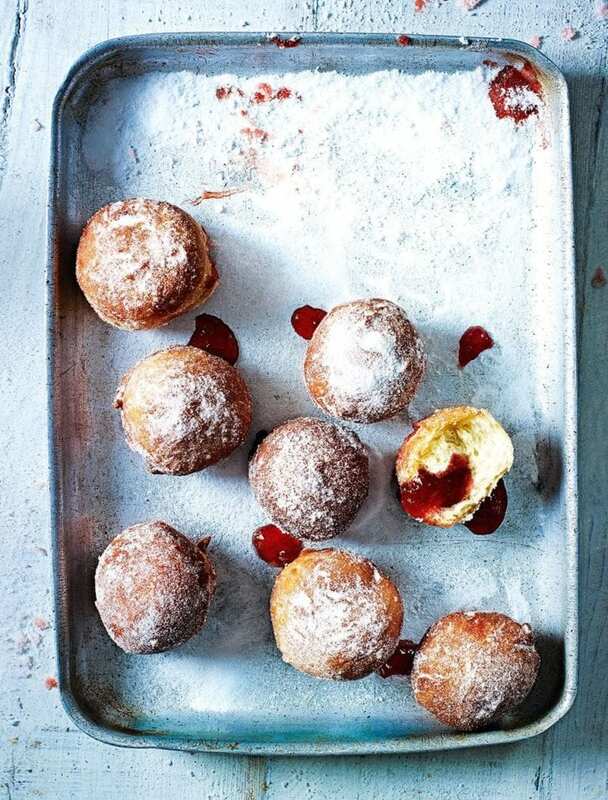 Fill a disposable piping bag with jam, snip off the corner and carefully squeeze jam into the centre of each doughnut – you’ll notice it expand slightly – then toss in a bowl of caster sugar while still warm. The doughnuts are best eaten straightaway, although they’ll keep for a day in an airtight container. Save the oil to use for deep-frying another time. Doughnut dough is quite wet and sticky, but don’t be tempted to add more four when you’re kneading it in step 2 – the moistness of the dough is what gives the doughnuts their lightness. After 10 minutes of kneading the dough should feel drier and more elastic. A good quality, softer-set jam is best for the filling (step 8), otherwise you’ll need to give it a good stir to break it up. For variety, try different flavours for the filling or use lemon curd, Nutella or even a good ready-made custard. You can add favourings to the sugar for coating the doughnuts (step 8). Mix a little ground cinnamon or vanilla extract (or seeds) into the sugar, or add finely grated lemon/orange zest. Make the dough the day before, then leave to rise in the fridge overnight. Bring to room temperature before kneading, shaping and proving. Or make the dough up to the end of step 4 and freeze it. Defrost when you want to use, then shape and leave to rise.